Over Memorial weekend my parents will be having an intimate backyard BBQ. To me nothing kicks off Memorial weekend quite like a S’more. Since the get-together is during the day, and having a S’more or two around a campfire is unlikely. 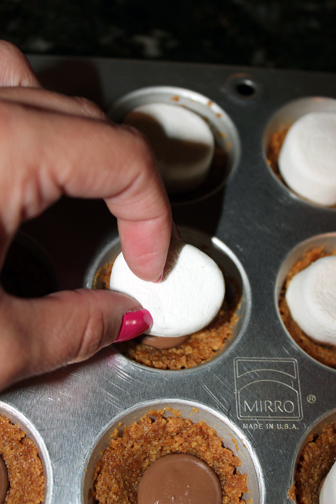 I will be bringing mess free petite S’more cups that will have the guest wanting S’more than one. 2. Combine graham cracker crumbs, butter and powdered sugar in a small bowl. 3. Place one tablespoon of crumb mixture in 12 cups of a mini muffin pan. Using the back of your measuring spoon press crumbs to form shallow cups. 4. Bake 5-7 minutes or until edges begin to bubble. 5. Remove pan from oven, and place a milk chocolate wafer melt or candy bar rectangle into each cup. Return to oven for 1 to 2 minutes to soften chocolate. 6. Get a pair of scissors wet, and cut marshmallows in half. 7. Place a marshmallow half, cut side down into each cup. Return to the oven on broil (be sure to leave the door cracked) once marshmallows begin to brown remove from the oven. 8. Allow the pan to cool on a cooling rack for 13-17 minutes – remove cups from pan and allow to cool completely. 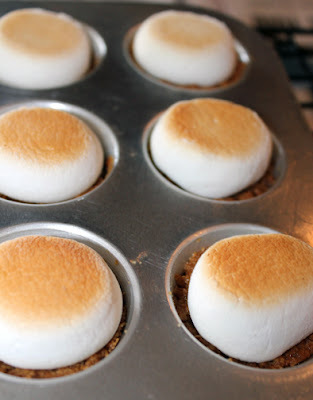 S'mores are one of my absolute favorite things, these look delicious! What a GENIUS idea!! I absolutely love these and will definitely be giving them a try - thanks for this great recipe! yummy! I pinned these0 they look delish! I love s'mores and thesee look SO good! Must try! Those look way beyond yummmy!! Pinned! Why have I never thought of this??? Sounds AMAZING! SUCH a great idea- you're a genius! I can so see these at summer parties this year. AWESOME! Love this idea - brilliant! Definitely making these this weekend at the beach! I love s'mores! Those looks amazing!! So easy too :) Thanks for reading my blog and I can't wait to get some yummy ideas from you! oh my, oh my. I was going to make s'mores bars for a Monday BBQ but I will be making these instead. YUM! OOOHHHH they look so fancy :) i am going to have to try this!! my fav thing to do is use all kinds of candy in a s'more. i think Peanut Butter cups would be fantastic in this!! Oh my gosh, these look fabulous! this is perfect! a great treat to bring to a picnic...a guaranteed hit!! Wow, these look ah-mazing! Another dessert my 'spare tire' will be enjoying this weekend! YUM and not nearly as messy at regular s'mores!! wow, looks yummy and easy to make! Most definitely bookmarking this recipe!! !